Watch This Gigantic RC Helicopter Crash After Just A Few Minutes Of Flying! - Muscle Cars Zone! Watch This Gigantic RC Helicopter Crash After Just A Few Minutes Of Flying! We all love RC toys, but these guys took the RC fad to the next step – they built their very own, functional but also gigantic RC helicopter modeled after the Agusta A-109. Of course, when you have a conversation starter as good as this one, you occasionally have to take it out for a spin, and show what that beast is really capable of. As it turns out, it`s capable of quite a lot! Just like any helicopter it takes a while to get its blades to spin fast enough and lift off, but once it does, it looks and sounds just as impressive as you`d think! Even more so, it moves with quite the flair and elegance through the air, almost as well as the real version made by Agusta. This gigantic RC helicopter is a turbine craft and it weighs just over 50 pounds, with a rotor diameter a little under 8 feet – that is truly huge for a toy! Of course, it emits an incredibly loud noise just like a real chopper and it also has the wind effect of a very small but very real helicopter. The pilot demonstrates how much he can do with all of his practicing, and while the helicopter looks very agile and impressive in the air, the celebrations are cut short really quickly. As soon as the pilot makes one movement which the helicopter doesn`t quite agree with, the yellow chopper starts plummeting towards the ground! It crashes pretty hard and the guys rush over to see what`s left of the wreckage. The blades seem to be intact, but the body is pretty shaken up. I hope they make it fly again, it was impressive. 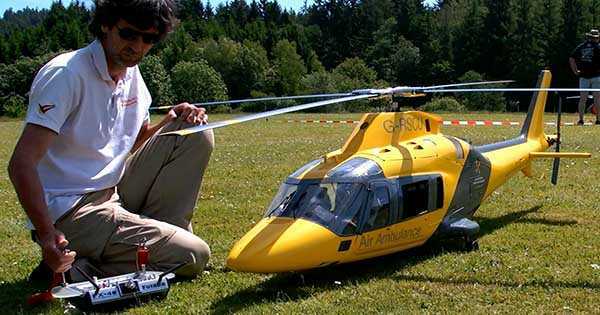 Finally, check out these giant RC planes!